The Mars Science Laboratory Curiosity rover performed coordinated measurements to examine the textures and compositions of aeolian sands in the active Bagnold dune field. The Bagnold sands are rounded to subrounded, very fine to medium sized (~45–500 μm) with ≥6 distinct grain colors. In contrast to sands examined by Curiosity in a dust‐covered, inactive bedform called Rocknest and soils at other landing sites, Bagnold sands are darker, less red, better sorted, have fewer silt‐sized or smaller grains, and show no evidence for cohesion. Nevertheless, Bagnold mineralogy and Rocknest mineralogy are similar with plagioclase, olivine, and pyroxenes in similar proportions comprising >90% of crystalline phases, along with a substantial amorphous component (35% ± 15%). Yet Bagnold and Rocknest bulk chemistry differ. Bagnold sands are Si enriched relative to other soils at Gale crater, and H2O, S, and Cl are lower relative to all previously measured Martian soils and most Gale crater rocks. Mg, Ni, Fe, and Mn are enriched in the coarse‐sieved fraction of Bagnold sands, corroborated by visible/near‐infrared spectra that suggest enrichment of olivine. 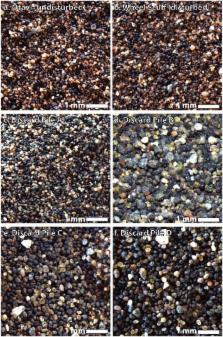 Collectively, patterns in major element chemistry and volatile release data indicate two distinctive volatile reservoirs in Martian soils: (1) amorphous components in the sand‐sized fraction (represented by Bagnold) that are Si‐enriched, hydroxylated alteration products and/or H2O‐ or OH‐bearing impact or volcanic glasses and (2) amorphous components in the fine fraction (<40 μm; represented by Rocknest and other bright soils) that are Fe, S, and Cl enriched with low Si and adsorbed and structural H2O. Sedimentary rocks of early Mars. Layered and massive outcrops on Mars, some as thick as 4 kilometers, display the geomorphic attributes and stratigraphic relations of sedimentary rock. Repeated beds in some locations imply a dynamic depositional environment during early martian history. Subaerial (such as eolian, impact, and volcaniclastic) and subaqueous processes may have contributed to the formation of the layers. Affinity for impact craters suggests dominance of lacustrine deposition; alternatively, the materials were deposited in a dry, subaerial setting in which atmospheric density, and variations thereof mimic a subaqueous depositional environment. The source regions and transport paths for the materials are not preserved. Copyright statement: ©2017. The Authors. Modulation of functional properties of laforin phosphatase by alternative splicing reveals a novel mechanism for the EPM2A gene in Lafora progressive myoclonus epilepsy.